The EL7201 servomotor EtherCAT Terminal, with integrated resolver interface, offers high servo performance in a very compact design. The fast control technology, based on field-oriented current and PI speed control, supports fast and highly dynamic positioning tasks. The monitoring of numerous parameters, such as overvoltage and undervoltage, overcurrent, terminal temperature or motor load via the calculation of a I²T model, offers maximum operational reliability. EtherCAT, as a high-performance system communication, and CAN-over-EtherCAT (CoE), as the application layer, enable ideal interfacing with PC-based control technology. 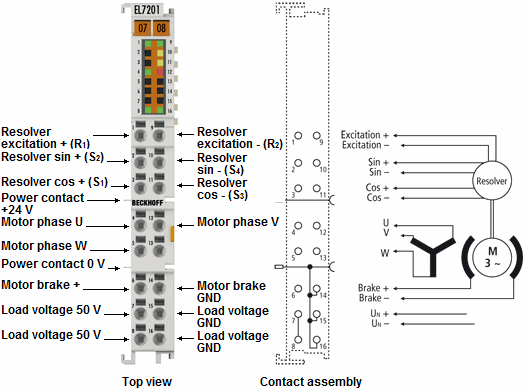 The latest power semiconductors guarantee minimum power loss and enable feedback into the DC-Link when braking. 16 LEDs indicate status, warning and error messages as well as possibly active limitations.